We’ve got a fun giveaway this week, sponsored by Stonyfield Farms and YoBaby Yogurt! Stonyfield’s YoBaby line of organic yogurts marks its 10th birthday this year by reformulating YoBaby to include vitamin D and zinc, both known to boost immunity and promote the development of strong bones and teeth. Of course, YoBaby is still all natural and certified organic, made with milk from cows fed organic feed and not treated with antibiotics or artificial growth hormones – since we’ve always believed organic is not only better for baby, but better for the planet as well. And so when she offered me some freebies for a giveaway, I jumped on the chance! 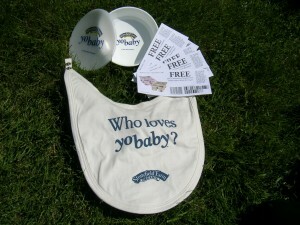 One lucky reader will win the Stonyfield farms YoBaby giveaway. Here’s what that includes: a YoBaby bowl with lid, organic YoBaby bib, and 5 Free coupons! The ways to enter at the bottom of the post. The French are renowned the world over for their innovative, elegant and refined cuisine. So it should come as no surprise that they start learning to cook at a very young age, although it may be more ‘short’ than haute, cuisine. This recipe is for a classic and simple French dessert, the gateau au yaourt, or French yogurt cake. Kids start learning to make it as soon as they can stir it together. I like it because it is endlessly customizable-not only through the flavor of yogurt used but also through the add-ins possible, limited only by your imagination. Preheat oven to approximately 375F. The temperature is converted from celsius and individual ovens vary, so feel free to adjust as necessary. Mix all ingredients together and pour into baking dish. Bake until a cake tester, or a fork, come out clean– 20-25 minutes. Allow to cool and enjoy. Some fun French yogurt cake vocabulary! Subscribe to my feed by RSS or email. Then send me the secret code at the footer of each post via the link or directly to almostfrugal at gmail dot com. You can also enter by leaving a comment on this post, but it’s one entry per person for this contest! The contest starts Monday June 8, 2009 at 12 noon GMT, and runs for 8 days until Tuesday June 16, 2009 at 12 noon GMT. Due to shipping costs, only people who are able to supply a US address are eligible to enter. The winner will be chosen randomly. I reserve the right to disqualify anyone for any reason. We love the Yo baby yogurt- We used the DHA one while my little one was smaller. Wow, I’ve never heard of yogurt cake? That sounds fun to make with my little boys! Thanks for the recipe! I already subscribe to your feed, and love reading your blog! I would love to win the goodies! Thanks! I subscribed to ur blog! My DD loves Yobaby yogurt. Thanks for the chance to win some free yogurt!